Sure, the table tennis tournament that your club hosted was great and unique. But how many tournaments in the US sport these features? The tournament i'm referring to is of course the NCTTA College Table Tennis Championships, but there is another tournament that i must mention as probably being of a similar class: the Mike Dempsey Memorial tournament. Para tournaments are routinely all-inclusive, though the entry fees tend to be significantly higher. Other tournaments that might come close in playing conditions are the US National Team Trials, and the North America Cup and North American Championships. Though these events have much fewer entry and table counts, and are a different kind of tournament. Back to the topic at hand. How does this tournament happen year after year, to the joy of table tennis-loving college students around the country? If i had to name a single reason it would be tournament director/championships committee chair Willy Leparulo. Willy drives the bus. When a piece is missing he finds it. When something's not going the way it's supposed to, he almost wills it to happen correctly. He's been doing it for years and doesn't seem to get tired of it. He's not perfect - and he'd be the first to admit or even flaunt it to you - but the amount of drive he shows in this role is incredible. But will, desire, and dedication are not enough. One person is definitely not enough. It's a two-year process with a lot of little pieces and if i listed all the steps there'd be a nice big wall of text here. To put things in perspective, i've run two-star, two-day tournaments with ten events using a two-person crew. I think i could run a four-star tournament with a three-person crew if i had some umpires i could call upon. 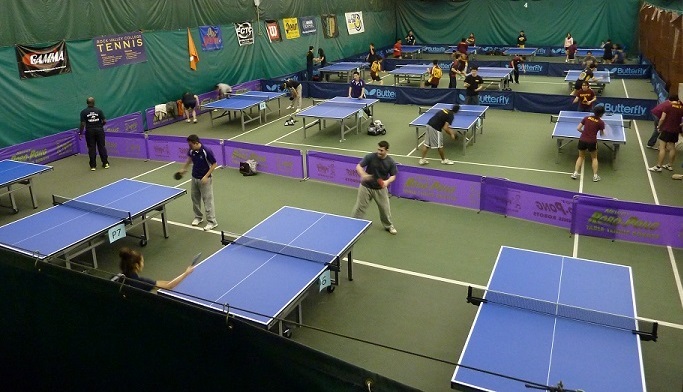 In contrast, the NCTTA Championships probably requires a bare minimum of 60 staff members, but generally about 100 people are used. There's no way i could name all of them, but they're all important. And the preparation time required is at least 20 times what's needed for a four-star tournament, and it might be more like 50 times. Of course this is impossible to measure but it's definitely a huge process and a ton of work. We have conference calls every month. There are documents to write for everyone - athletes, on-site staff, coaches, spectators. Contracts to bid out, evaluate, revise, and sign. Equipment to rent or buy. Staff to recruit and train. (Anyone know of a US city or even state has 30 umpires ready to go?) All sorts of preparation needed so that the tournament setup and competition can run like clockwork with no overhead, no missing steps or planning that we overlooked. And then we need to run the tournament itself. What do we, the organizers, get out of this? Of the core staff (tournament director, technical delegate, competition manager, referee, and volunteer coordinator), only the competition manager is paid. And the amount he's paid probably doesn't cover his expenses. I did receive an event shirt. A lot of us received headaches, even if we didn't ask for them. But we do get the pleasure of putting on what i believe is the best table tennis event in the country. And we keep people playing after they leave the junior ranks. The vast majority of them say they're having fun. After the tournament i kicked back and . . . wrote the tournament recap for the USATT magazine. Then i started preparing myself for the next tournament i would be working at. We're just starting the process for the 2015 tournament, and we're in the middle of working on next year's event. In a couple weeks Ed Hogshead and i will be traveling to Monroeville, PA (a suburb of Pittsburgh) to inspect the site of the 2014 Championships. I think it'll be the best ever.